Harvard Education PR, 9781682531327, 224pp. Based on ten years of research and interviews with practitioners across the United States, the book theorizes the existence of a "moral center" that can be pivotal in guiding teacher actions and expectations on the job. Education philosopher Doris Santoro argues that demoralization offers a more precise diagnosis that is born out of ongoing value conflicts with pedagogical policies, reform mandates, and school practices. 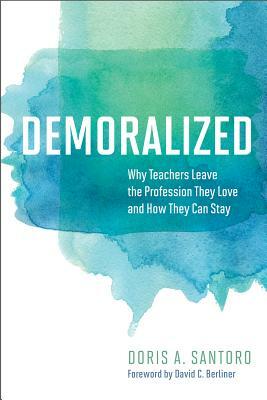 Demoralized reveals that this condition is reversible when educators are able to tap into authentic professional communities and shows that individuals can help themselves. Detailed stories from veteran educators are included to illustrate the variety of contexts in which demoralization can occur. Based on these insights, Santoro offers an array of recommendations and promising strategies for how school leaders, union leaders, teacher groups, and individual practitioners can enact and support "re-moralization" by working to change the conditions leading to demoralization.